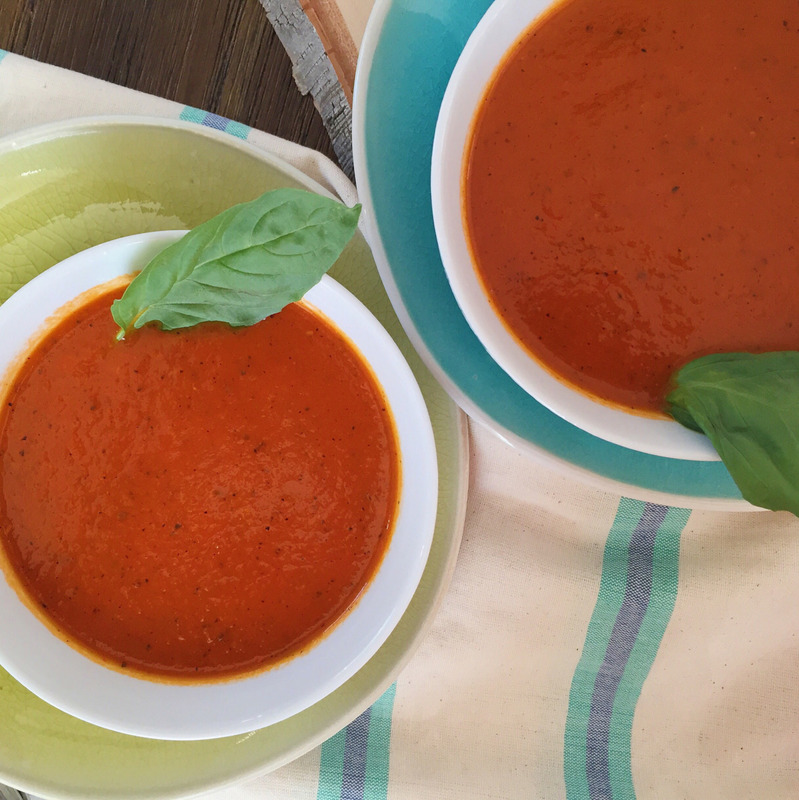 Creamy Thai Basil Tomato Soup – A Healthy Pinch. I am a sucker for soup in any season but this meal choice is much more appropriate this time of year. Especially when it’s raining and cold (though here in NorCal, cold is a relative term). That being said, we will be eating soup for the next few months and I couldn’t be more excited! Actually I will be eating soup for the next few months. My husband doesn’t usually join me for dinner when soup is involved, probably because he doesn’t find it to be a substantial meal. The next question is usually, “Soo…is there anything else for dinner?” followed by a sheepish smile. If you’re familiar with Seinfeld and his ongoing battle with Banya about whether soup at a restaurant is a meal, then know I’m fully on Team Jerry. It IS a meal and soup for the win! Typically I’ll roast some tomatoes and onions together with garlic and Italian spices, add them to some veggie stock and BOOM. Dinner. However, I wanted to try something a little different this time around. 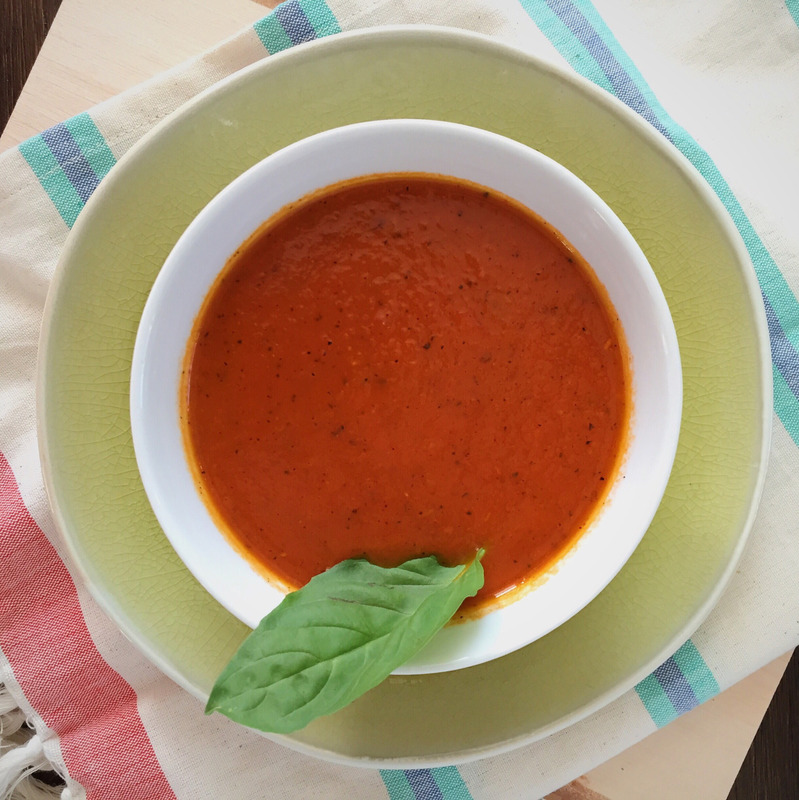 This version is based upon a Thai basil tomato soup my sister-in-law ordered at one of our favorite downtown Sacramento brunch spots. It was hearty and flavorful and though it had never occurred to me to build upon Thai flavors, it totally works. So the base starts with your basic onions and garlic, because of course. Add some lemongrass and basil. Throw in some fish sauce for the salty element and Thai garlic chili paste for some kick. Finally, I used a couple cans of Muir Glen roasted tomatoes because they are simply the best. When it’s all said and done, you get the creaminess from the coconut milk, hints of lemongrass, ginger and basil and finally a subtle kick at the finish. Unique and yummy! Heat oil in a large pot over medium heat. Once oil is hot, sauté the onions until soft and translucent, about 7-10 minutes. Add in the minced garlic, ginger, lemongrass and basil; cook for another 1-2 minutes until fragrant. Stir in the fish sauce first, then add the tomatoes, vegetable stock and chili paste (now, my tastebuds are weak when it comes to spice, so feel free to add more chili paste or chili flakes if desired). Give everything a good stir and bring the mixture to a boil, then cover and simmer for 20 minutes. With an immersion blender, puree until smooth. Taste and season with more fish sauce if needed…I did. Pour in the coconut milk and blend some more. Ladle into bowls and serve! To make the soup more substantial, it could certainly benefit from the addition of rice or another grain, however I enjoyed it as is.